Full details about the scheme can be found on the Dept. of Education website. Details of the new ECCE programme announced in budget 2018. If your child attends a half-day or “sessional” service, such as a playschool, Montessori or Naíonra, the normal pattern for the free pre-school year is 3 hours a day, 5 days a week, over 38 weeks. If your child attends for more than 3 hours, you will be charged for the extra time. If your child’s sessional service cannot open for 5 days a week, the normal pattern for the free pre-school year is 3 hours and 30 minutes a day, 4 days a week, over 41 weeks. If your child attends a full-time or part-time daycare service, the normal pattern for the free pre-school year is 2 hours and 15 minutes per day over 50 weeks. If your child attends for longer than this each day, you will be charged for the extra time. To facilitate parents whose children attend a full or part-time service for only 3 days a week, such a service can opt to provide 3 daily free pre-school sessions of 3 hours 45 minutes each week over 50 weeks. 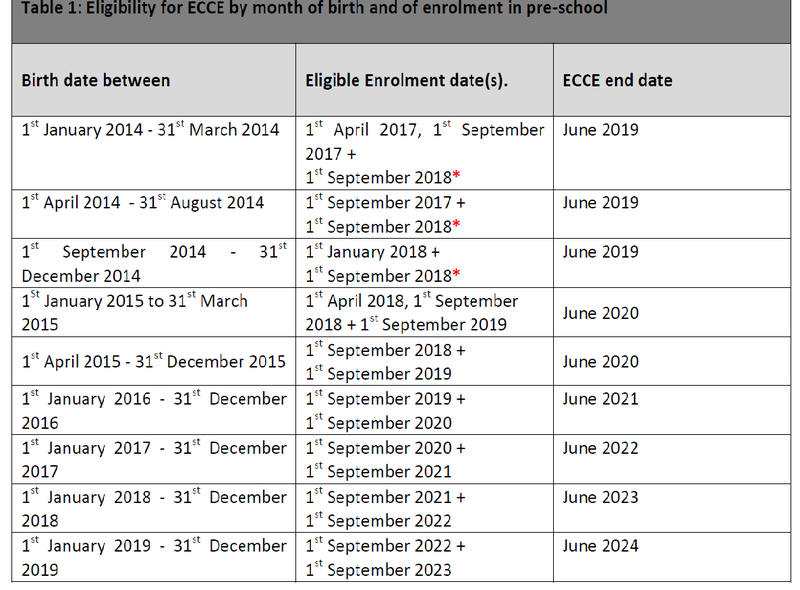 Click here for more information on the Dept of Children and Youth affairs regarding the ECCE scheme.